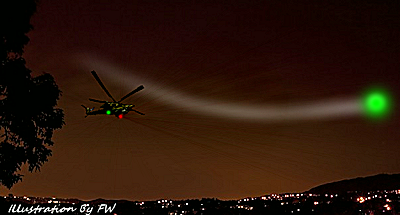 Several local residents reported seeing a UFO, described as “a green orb” fly over Pauma Valley on the evening of Tuesday, November 24, with much slower U.S. Marine helicopters giving chase. The Roadrunner has obtained an eyewitness account of the sighting by local resident Dave MacPherson. Several other local residents, including residents on Miller Road have confirmed MacPherson’s account. The following is MacPherson’s account: “On Tuesday, November 24, 2015 at around 7:30 p.m. while sitting on our porch my daughter and I observed a military helicopter flying at about 3,000 feet headed east over Pauma Valley. When the helicopter reached the junction of Highway 76 and S6 it turned around and flew back directly west over Pauma Valley.